Scott Cramer has sold offbeat, left-leaning T-shirts, political buttons and bumper stickers through his Northern Sun Merchandising company in Minneapolis for more than 30 years. Which is why Cramer is more than happy to lease his 5,000-square-foot rooftop for what will soon be one of Minnesota’s first shared, community-owned solar installations. Minnesota Gov. Mark Dayton signed a bill last week that requires the state’s largest utility, Xcel Energy, to establish a community solar gardens program early next year. The idea is to let customers who can’t or don’t want to install solar panels on their own rooftop instead buy individual panels in a nearby solar development. The electricity generated by a customer’s panels is credited to their utility bill as if they were installed on their home or business. Solar gardens aim to overcome a big barrier for solar power in the state: despite Minnesota’s generally good solar resources, only about a third of residents have a rooftop that’s sunny enough, strong enough, and angled correctly for installing solar panels. Meanwhile, others may have an ideal, sunny location but don’t necessarily have the electricity need or the financial resources to fully capitalize on their solar resource. The solar garden will be developed by Applied Energy Innovations (AEI), which announced the project on the day Gov. Dayton signed the bill into law. The company is spinning off a new unit, MN Community Solar, that will specialize in solar gardens. The 40-kilowatt installation will be large enough to power eight to 10 homes. The company needs to recruit at least five subscribers, who must be Xcel customers in the same or an adjacent county. No one participant can own more than a 40 percent share. “Just within a five-block radius, you could probably sell out that 40 kilowatts. People could feel real ownership of panels that are in their own neighborhood,” said Laura Cina, managing director of the Minnesota Renewable Energy Society. The experience in other states suggests the company should have little problem finding customers. In Colorado, an Xcel solar gardens program last summer sold out in less than 30 minutes, receiving three times as many applications as it could fill. “We expect to sell our subscriptions pretty quickly,” Teigland said. The solar gardens concept originated in Ellensburg, Washington, where a municipal utility and community groups successfully brought a 36 kilowatt project online in 2006 and have expanded it to 78 kilowatts. Since then, they’ve been slowly sprouting up across the country, with the largest clusters in the Southwest and Mid-Atlantic. The Solar Gardens Institute in Westminster, Colorado, is aware of a few dozen nationwide. Joy Hughes, the institute’s founder, said Minnesota is among the first states to pass legislation specifically authorizing or requiring solar gardens. Other states don’t necessarily prohibit solar gardens, but they can be legally and logistically more challenging without the legislation. In the Midwest, existing solar gardens include a 50 kW utility project in Decorah, Iowa, a 50 kW solar cooperative in Omaha, and a crowd-funded development in Minnesota northwest of the Twin Cities. The new Minnesota law will help streamline the process of connecting solar gardens to the grid for customers in Xcel Energy’s territory, which must accommodate the systems under the law. “Now everybody can go solar. You don’t have to have a sunny roof. You don’t have to own your own roof. You can take your subscription with you when you move.” Hughes said, listing some of solar gardens’ benefits. They also offer customers economies of scale they wouldn’t be able to achieve with individual rooftop projects. The size of solar gardens is capped at 1,000 kilowatts — much larger than an average 5-kilowatt residential system. AEI is still determining what price it will charge for shares of its Northern Sun solar garden, but Teigland said it will be competitive and hopefully less than what it would cost for the same amount of capacity installed on a residential rooftop. Northern Sun already has a smaller solar array on its roof, which Cramer says he’ll dismantle to sell or reuse on another building. Unlike Xcel Energy’s Windsource program, where customers pay an extra fee each month to receive a dedicated portion of their power from wind farms, a solar gardens subscription will lower customers’ monthly bills, after an upfront investment. Cina said the cost-per-panel in other states has been around $600, with a payback time in the range of 12 to 15 years. An escrow typically covers repairs and maintenance for around 25 years. The programs are not without opponents. In Colorado Springs, for example, the city council last month pulled the plug on a previously approved expansion of a municipal utility solar garden, citing costs to ratepayers. Under the Minnesota law, Xcel Energy has until Sept. 30 to file a plan with state utility regulators for setting up and operating a community solar gardens program to take effect Jan. 1, 2014. Other utilities can choose to file plans but aren’t required to offer programs. 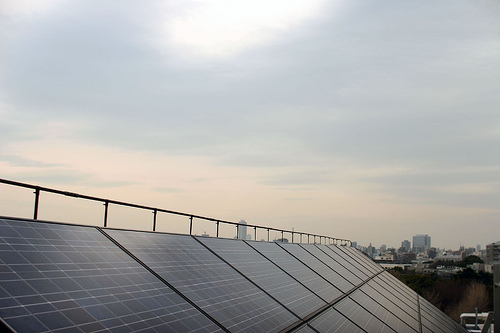 AEP hopes to begin installing panels on Northern Sun’s rooftop next spring.